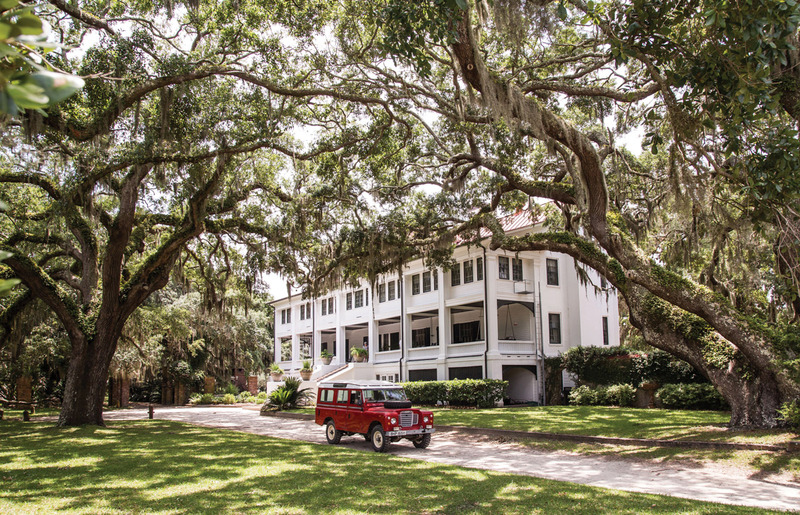 Home to Carnegies, host to Kennedys, Cumberland Island and its historic inn enchant visitors who make the trek to this secluded destination off Georgia’s coast. Fifteen barrier islands line the coast of Georgia. The southernmost and largest is called Cumberland. No bridges link it to the mainland, and a lone public dock affords boats access to its shores. On this land mass one-third larger than Manhattan, more than 150 wild horses roam free. Feral hogs root in the brush beneath thick stands of pine. Muddy oyster beds fizz and pop in the noonday sun, the sound of hungry mollusks awaiting the coming tide. Along a seventeen-mile stretch of shoreline, thousands of migratory birds skim the Atlantic for food. Only a handful of habitable dwellings dot the landscape. Most are owned by descendants of steel tycoon Thomas Carnegie (though a few on the north end belong to heirs of Coca-Cola founder Asa Candler). Just one welcomes overnight guests: Greyfield. Constructed in 1901 for Carnegie’s daughter Margaret, the Colonial Revival mansion has withstood violent hurricanes and encroaching wildfires; it has proven resilient in the face of crippling taxes and enticing offers to sell, develop, brand. The press later reported that the bands were handmade by one of Greyfield’s owners, Janet “Gogo” Ferguson, a Carnegie heir and friend of John’s. But everyone seemed to miss what she had molded them from: the delicate ribs of a Cumberland Island rattlesnake. The ferry ride from Fernandina Beach, Florida, to Greyfield’s private dock takes half an hour. As the crow flies, it’s a roughly eight-mile journey. In the late 1960s, developers pushed for the construction of a causeway from the mainland to Cumberland, not unlike the one built from Brunswick to Jekyll Island in 1956. But their efforts were blocked by the U.S. Armed Forces: A highway would have prevented military vessels from snaking around Cumberland into neighboring Kings Bay Submarine Base. Today, kayakers exploring the area’s marshes still marvel when a 550-foot submarine slinks past, pushing up a monstrous wake. Mitty and his wife, Mary, run the inn on behalf of the family, as they’ve done on and off since 1978, sixteen years after Greyfield began welcoming paying guests. Mitty, sixty-six-year-old Gogo, and their three brothers grew up summering on the island and spent many a carefree night at Greyfield. But while Mitty’s ties to the inn are undeniably personal, they are also practical. Yes, he descends from the Carnegie line, but he is without a silver spoon. Mitty and Mary work because they must, and if Greyfield is not profitable, it will eventually be sold. This is no mere avocation. Mitty pilots the boat to a simple dock, where a young man wearing a white oxford and khakis, his hair pulled into a ponytail, stands waiting. He welcomes us, introducing himself as Daniel. It’s a short walk to the house, he says; the staff will handle our bags. 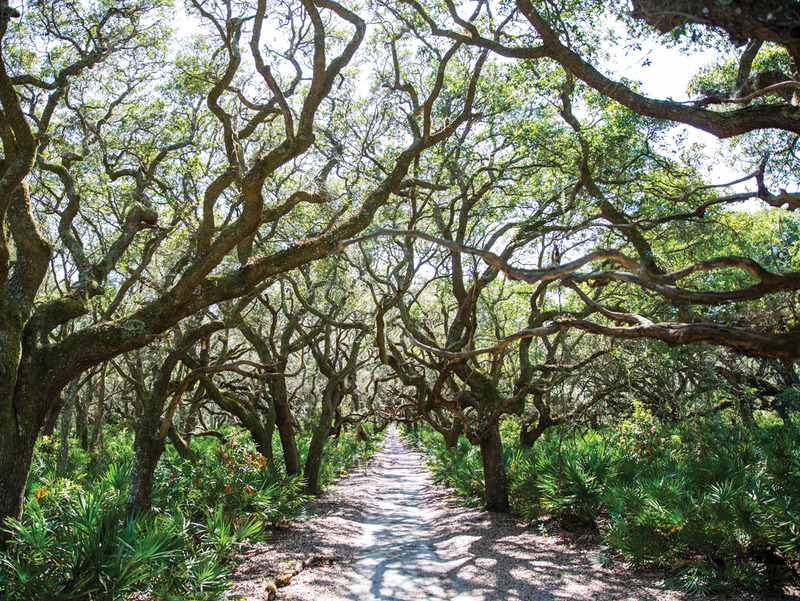 We follow him away from the Atlantic and into a grotto created by a canopy of live oaks. Their long arms bend and twist over our heads, casting a mosaic of shadows on the sandy ground. After a few minutes of walking, the oaks thin and I spot Greyfield. Looming three stories and gleaming white, it has a weatherboard facade, a red tin roof, and three chimneys from which smoke wafts. A broad sweep of stairs leads to the front porch, where ceiling fans turn lazily above oversized swings. “Welcome to Greyfield,” Daniel says. He leads us up to the porch, opens the front door, and gestures toward the small foyer. We step inside. Directly in front of us is a double staircase. Walk upstairs, Daniel says, and we’ll reach eight of Greyfield’s fifteen guest rooms—none of which, he adds, are outfitted with television or WiFi. Go down, and we’ll be in the raised basement, where the main dining room, community kitchen, and gift shop are located. To our left is the living room; to the right, the library and bar (where we may help ourselves to whatever suits our fancy, noting our drinks on chit cards). Daniel extends his arm to the left, and we enter the pine-paneled living room. A fire flickers softly, casting orange light on velvet couches. Porcelain lamps rest on ornate side tables. 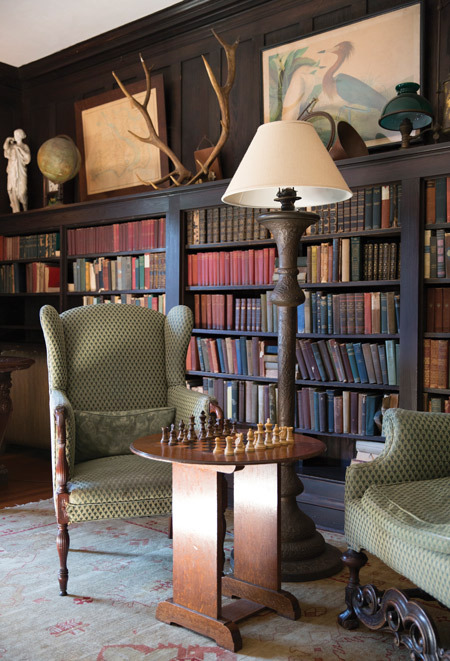 “All the furniture at Greyfield is original to the Carnegie family,” Daniel tells us. The heavy red curtains are drawn back, revealing deep-set windowsills strewn with the sun-bleached skulls of sea turtles, alligators, and boar. Paintings of family members hang on the walls, among them a portrait of Margaret Carnegie Ricketson, one of Thomas and Lucy Carnegie’s nine children and the woman for whom Greyfield was built. She is ethereal in a white gown and veil, her gaze trained somewhere in the distance, every inch a member of America’s aristocracy. Across the room hangs a portrait of her daughter, Lucy Ferguson—whose name graces Greyfield’s boat. The contrast between mother and daughter is striking. Unlike Margaret, who grew up in the salons of Pittsburgh, Lucy spent most of her life on the island, living at Greyfield and raising cattle. Instead of a formal gown, she wears a simple green dress, a red scarf tied gypsy-style around her head. Her right hand grips a leather belt, to which a large Buck knife is affixed. Lucy was known to kill any predator that threatened her property or her menagerie of animals, including her beloved pet buzzard. She taught her granddaughter Gogo to skin a rattlesnake with one cut. Lucy stares at me, a ghost of a smirk dancing on her lips. Greyfield was not the first Carnegie mansion erected on Cumberland. Almost twenty years earlier, Thomas built Dungeness as an escape from Pittsburgh’s pollution. With fifty-nine rooms, the Queen Anne Gothic house required more than 150 full-time staff members to maintain. Though Thomas died of pneumonia in 1886 when he was just forty-three, his wife, Lucy, continued to winter at the estate until 1915, when her own failing health forced her to forgo trips to Cumberland. Today, all that remains of Dungeness is ruins. After Lucy left, her heirs struggled to maintain the mammoth house and moved its furniture elsewhere, including two miles north to Greyfield. In 1959, poachers set the crumbling estate ablaze, payback for the Carnegies’ refusal to permit them to hunt the island’s boar. 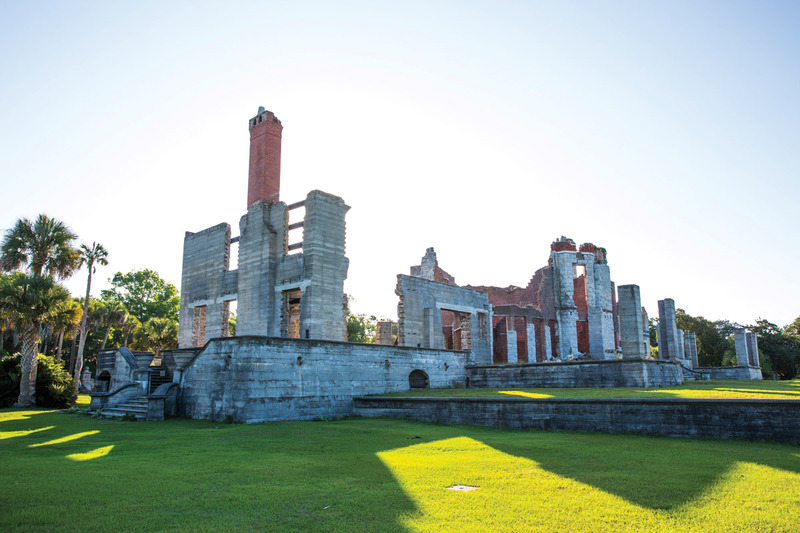 The family sold the property to the National Park Service in 1972, and Greyfield offers its guests tours of the ruins. Guests may also ride six miles north in the back of Greyfield’s pickup truck to visit Plum Orchard, the winter home Thomas and Lucy built for their son George in 1898. Designed by famed architectural firm Peabody and Stearns, the 24,000-square-foot Georgian Revival home is the island’s number one attraction. Carnegie descendants wintered in it until 1970, when they sold it to the National Park Service. Regular tours conducted by both Greyfield and the park service showcase the home’s amenities—many far ahead of their time. These include heated towel racks and an indoor pool and squash court, complete with a vaulted seating area for spectators. Yet another turn-of-the-century Carnegie estate, Stafford Plantation, remains in family hands. Once owned by cotton baron Robert Stafford, Thomas Carnegie purchased the plantation two miles north of Greyfield in 1881. 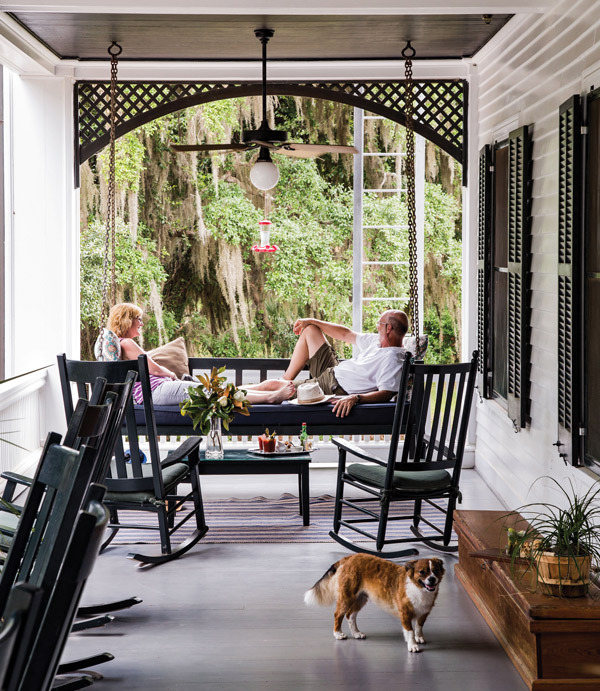 A cousin of Mitty and Gogo’s, Lucy Foster, owns the narrow, two-story frame house overlooking miles of fields where more than 350 slaves once harvested a cash crop of Sea Island cotton. Today, those fields are overgrown, their thick grasses a feeding ground for the island’s horses. All that disturbs the landscape is a small airstrip buzzed into the field, a Cessna 182 parked at its edge. The plane belongs to Gogo’s husband, Dave. He and John F. Kennedy Jr. were good friends; they shared a love of flying, of water skiing, of beaches on the edge of civilization. When John and Carolyn left Greyfield for their honeymoon in Istanbul, it was Dave who flew them off the island. Dinner at Greyfield is an evening-long affair. 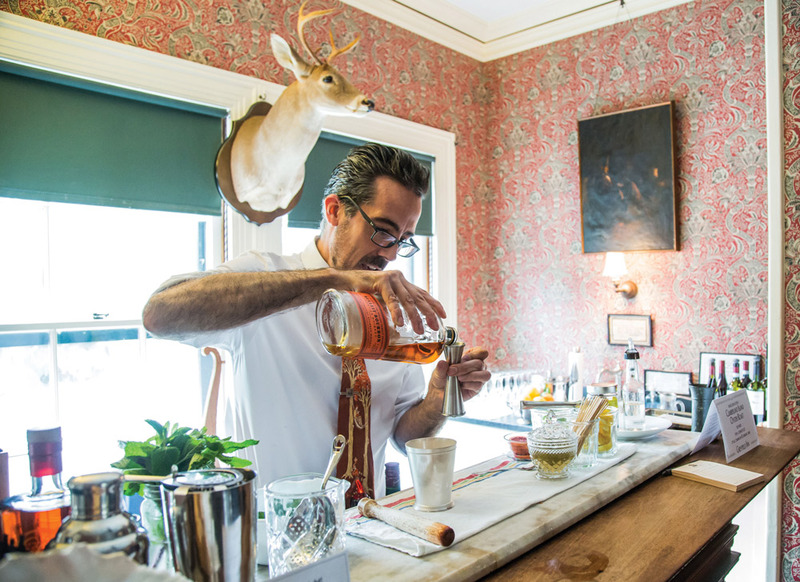 It begins at 6:00, when cocktails are served in the gunroom-turned-bar. I order a gin and tonic, which Daniel serves to me in a beveled glass. Drink in hand, I walk into the library. Wall-to-wall bookshelves are jammed with hundreds of faded titles from the Carnegie family collection. Issues of Harper’s Weekly date to the 1860s, and first-edition books bear Lucy Carnegie’s careful signature on the inside cover. I’m told there’s a first-edition Winnie the Pooh somewhere on these shelves, but it doesn’t reveal itself. With dinner not scheduled to commence until 7:30, I refresh my gin and tonic and walk outside, following the sand-lane road a few hundred yards to Gogo’s shop. During the months she and Dave reside on Cumberland, typically fall to spring, Gogo scours the island for boar tusks, raccoon ribs, and dolphin vertebrae from which she fashions necklaces, wine stoppers, and cuffs. Hillary Clinton wears a necklace Gogo created from armadillo scales; Bill Murray, a friend and repeat customer, buys Gogo’s oyster-shell serving spoons as gifts. Gogo’s work is also available in namesake galleries on St. Simons Island and Martha’s Vineyard and was showcased in a special exhibition at Atlanta’s High Museum of Art a few years ago. The one-room shop adjoins Gogo and Dave’s cottage, which they built with lumber and fixtures recovered from her family’s old homes and barns. The shop’s windows are dark. I peer inside, where tables spill over with Gogo’s creations; she designs most of them upstairs in her attic workshop. I listen for noises above, and hearing none, decide to return another time. 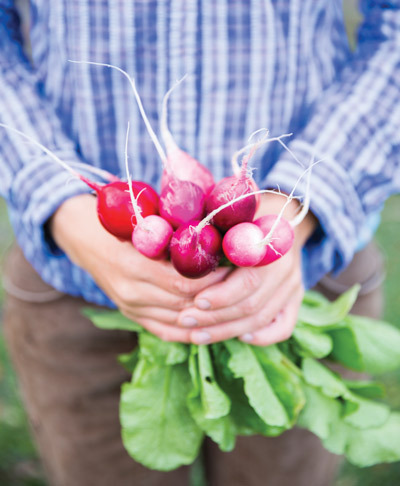 Two staff members tend the gardens full-time, composting the inn’s scraps and gathering honey from its more than twenty hives. They also repair fences and build screens to protect the crops from the island’s many animals. Mitty and Mary say if there’s one thing for which they hope the inn is known, it’s this live-off-the-land approach to food. From the front porch, a dinner bell chimes, and I join the other guests in the dining room. We’re seated around a Chippendale table that once belonged to Lucy Carnegie; the flowers in the centerpiece were cut from the garden that morning. I introduce myself to my dinner companions: a couple from Atlanta celebrating their thirtieth wedding anniversary; snowbirds from the Keys working their way up the East Coast; newlyweds from Charleston on their honeymoon. based Anson Mills topped with chicken-leg confit bathed in a lemongrass-herb broth. Slender mokum carrots and turnips grown in the garden surround the dish. As we eat, Christopher Becerra, Greyfield’s beverage director, pours wine with a liberal hand. Between courses, the woman from Atlanta leans toward me. “This place isn’t what I expected,” she says, lowering her head and raising her eyebrows. “When you hear JFK Jr. got married here, you don’t think it will be so . . . ” she pauses. 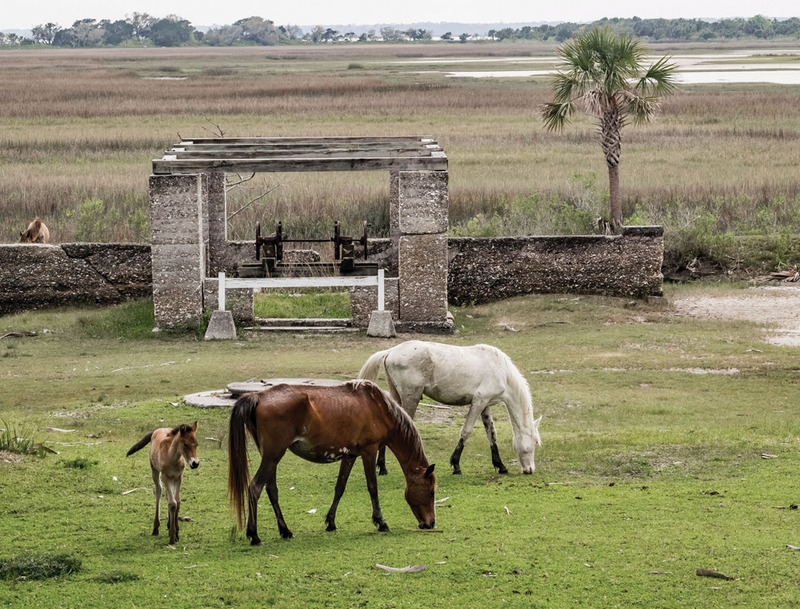 When Thomas Carnegie’s wife, Lucy, died in 1916, she owned 90 percent of Cumberland Island. According to her will, none of this land could be divided or sold until all her children passed away. In 1962, following the death of Florence Carnegie Perkins, the trust was terminated, and the property was split into ten tracts and given to Lucy’s heirs. 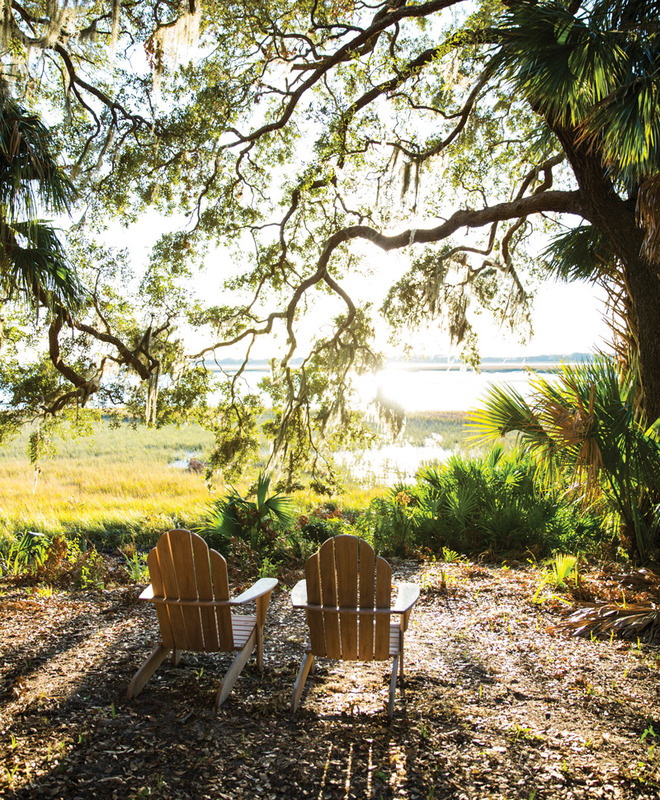 Some sold their land, most notably to Hilton Head developer Charles Fraser, who purchased more than 3,000 acres in 1969 with an eye on development. Many family members who did not sell opposed Fraser’s efforts, and a battle for control of Cumberland ensued. The state backed Fraser, even going so far as to contemplate condemning the remaining Carnegie land and leasing it to him. The tug-of-war drew national attention, and in 1970, the Andrew W. Mellon Foundation donated $5 million to the National Park Service so it could make a bid for the island. Ultimately, Fraser capitulated, and he, along with several Carnegie family members, sold a total of 8,300 acres to the park service. The NPS has continued buying land on Cumberland, and today, only about 900 of its 17,000 acres remain in private hands. As part of the NPS agreement with the Carnegies, the agency maintains the structures on land it purchased, including Dungeness and Plum Orchard. How well it accomplishes this is subject for debate. Preserving historic buildings on a remote barrier island is an expensive and unending task. At Dungeness, informational signs about points of interest are covered by broken plexiglass, making them difficult to read. A house where the Carnegie children were once tutored has been sitting untouched for years. At Plum Orchard, despite several million dollars in renovations a decade ago, the paint is badly chipping and water drips from the ceilings. “I call it demolition by neglect,” Gogo says. 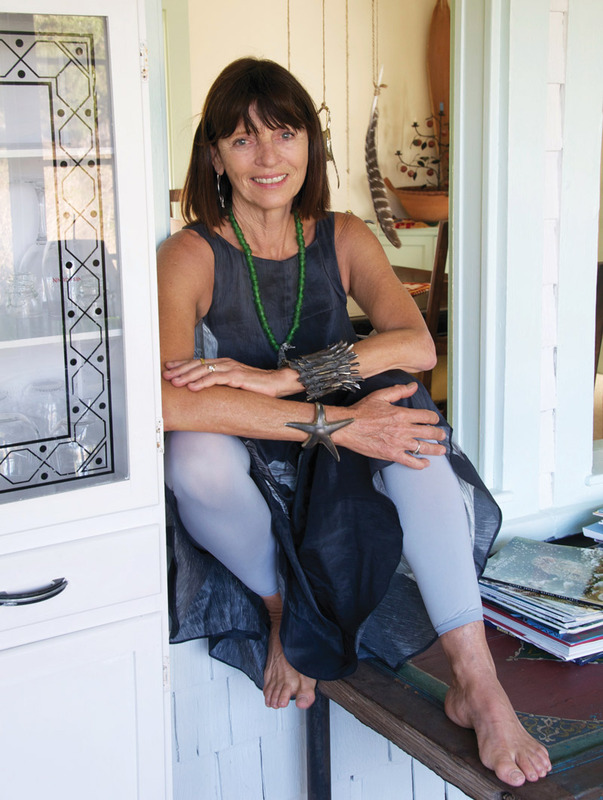 In the 1990s, she came up with a plan to turn Plum Orchard into an artists colony: The colony would lease the house, providing much-needed funds for its upkeep, and the home would remain open to the public for weekly tours. Pals like John F. Kennedy Jr. helped with fundraising, and even the island’s park superintendent supported it. But environmental groups balked, worried about the impact more residents would have on the island. After years of battling, these groups defeated the plan. There are several spacious suites at Greyfield with sitting areas and corner views; South Marsh isn’t one of them. A small room with twin beds, it shares a bath with a neighboring room. South Marsh was Lucy Ferguson’s room when she was a girl, before she was herding cattle and skinning rattlesnakes. In 1915, when Lucy was sixteen, someone—no one can quite say who—gave her a diamond ring. She was fairly uninterested in the stone’s brilliance, but she was fascinated by its strength. She had heard diamonds could cut glass, and now she could test that rumor. Lucy carved her name into her window, along with the year. It is still as clear as the day she wrote it, and any guest who stays in her old room can’t look out at the marsh without seeing her autograph. is now as integral to the island as its towering pines. Others argue that the only thing truly worth preserving is nature; using taxpayer dollars to barely maintain the former mansions of a moneyed few is a fool’s errand. Too, it places an outsized value on what amounts to a brief period in the island’s history. The NPS may decide in their favor or simply defer a decision; in either case, these voices may be heeded. Under current circumstances, it’s hard to imagine a place like Plum Orchard still standing a few decades from now. Which makes Greyfield all the more noteworthy. Not only is it privately owned, it’s maintained by a staff of twenty. A fresh coat of paint is applied to a different section of the house throughout the year. Furniture is dusted daily; leaks are fixed. It isn’t the largest Carnegie mansion, nor was it the first, but it may be the only one that lasts. On my last day on Cumberland, Gogo and I bounce along sand-lane roads in her truck. She points out places where she often finds Native American arrowheads to add to her collection. Just outside Dungeness, she pulls over next to a chain-link fence with a padlocked gate. “I want to show you something,” she says, taking out a key and opening the gate. She is wearing a straw hat, her dark hair falling in waves to her shoulders. A rattlesnake-rib bangle is cinched above her left elbow. We follow a grassy path through the brush, which leads us to two stone pillars marking the entrance to the Carnegie family cemetery. She keeps walking, pointing out the gravestones of her grandmother Lucy and her great-grandmother Margaret. Behind one grave sits a small Buddha statue. “That’s Aunt Cindy,” Gogo says. “She really inspired me.” Cindy was a fellow artist who taught a young Gogo how to turn a deer pelvis into a mask and instituted a weekly arts day on the island when Gogo was a child. In the back of the cemetery are the grave markers for Thomas and Lucy Carnegie. Instead of lying flat like the others, they are raised above the earth like tabletops. Behind them stands a curved wall, tall and gleaming white; it lends the gravesite the feel of a temple. Gogo walks to one end of the wall and instructs me to walk to the other, some ten feet away. “Listen,” she says under her breath, but her voice is in my ear. I look at her with surprise. “It’s a whispering wall,” she explains. She looks out over the graves of her ancestors. We are quiet. “Is this where you’ll be buried?” I whisper. In the moment, it seems a normal thing to ask. “Absolutely,” she replies, and she shifts her gaze toward me. “This is where I belong.” She looks like her grandmother Lucy, wearing a bangle made of rattlesnake ribs, a ghost of a smirk dancing on her lips.